Since the completion of the show-cave tunnel to Chamber 20 in Wookey, last year, a number of groups have been digging and exploring in various nooks and crannies that had never been properly pushed by the divers. This work has now borne its first fruits with the discovery of an overland (dry) route to Edmund’s Chamber by Andrew Atkinson and Ali Moody. This chamber was first discovered by Colin Edmunds in 1975 but then remained unvisited for the next 19 years. It is 5 metres wide, about 20 metres long and over 15 metres high and has no dry land at water level. The new find was entered by Ali through an extremely tight, dug squeeze. An upper route, still tight, was dug out to let Andrew enter. After an initial boulder chamber came a duck under where footprints were found. They then followed an angled rift, in conglomerate, with beautiful walls. They have so far surveyed for 109 metres to a pitch. The footprints probably belong to Peter Glanvill and Brian Johnson, who climbed into an elliptical scalloped bedding they named “Beyond the Thunderdome” in 1986. 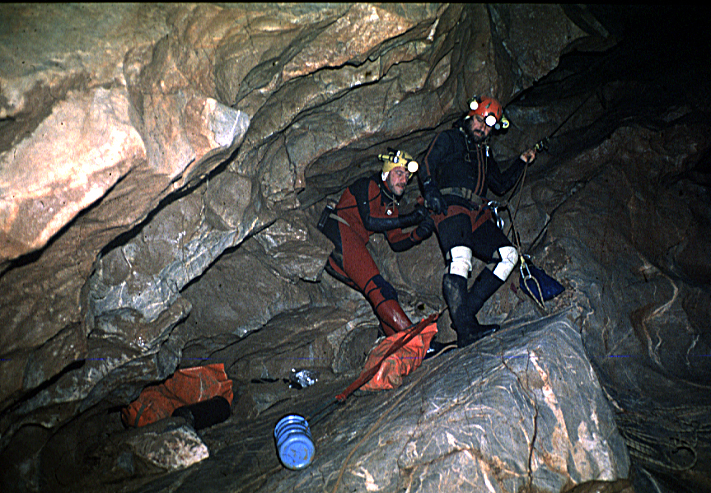 The link is tortuous and unsuitable for transporting diving gear but will enable climbers to take a look at some long standing possible leads high above the water. This is undoubtedly the first of many new discoveries in Wookey following the opening up of Chamber 20 by the show-cave’s management.